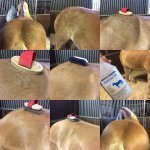 Grooming was easier than any other product we have used! This horse has HAIR and Manely does the task and more. Don’t waste the time or money with anything us!!! Manely WORKS MIRACLES!! Meet Icor imported from the Netherlands owned by Green Country Gypsy Horses, also a Manely Long Hair customer! Great Before and AFTERS! Check the feather on this outstanding stallion! He is 11 years. 14.3h, heavy grade, Bay roan stallion.